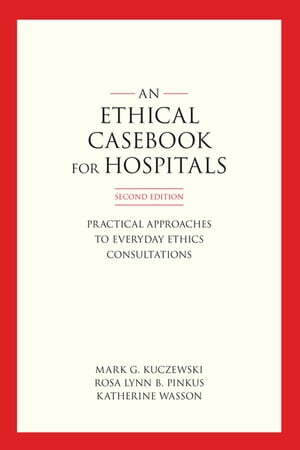 Collins Booksellers - An Ethics Casebook for Hospitals by Mark G. Kuczewski, Rosa Lynn B. Pinkus & Katherine Wasson, 9781626165519. Buy this book online. Originally published in 1999, this classic textbook includes twenty-six cases with commentary and bibliographic resources designed especially for medical students and the training of ethics consultants. The majority of the cases reflect the day-to-day moral struggles within the walls of hospitals. As a result, the cases do not focus on esoteric, high-tech dilemmas like genetic engineering or experimental protocols, but rather on fundamental problems that are pervasive in basic healthcare delivery in the United States: where to send a frail, elderly patient who refuses to go to a nursing home, what role the family should play in making a treatment decision, what a hospital should do when it is getting stuck with too many unpaid bills. This thoroughly revised and updated second edition includes thirteen new cases, five of which are designated as "skill builder" cases aimed specifically at persons who wish to conduct clinical ethics case consultations. The new cases highlight current ethical challenges that arise in caring for populations such as undocumented immigrant patients, persons with substance use disorders involving opioids, and ethical issues that arise beyond the bedside at the organizational level. The reader is invited to use the supplemental videos and assessment tools available on the website of the Loyola University Chicago ACES project (www.LUC.edu/ethicsconsult).